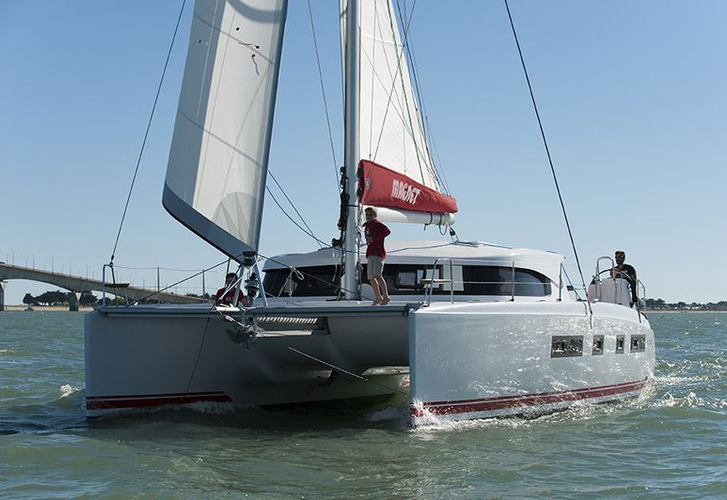 In 2011 has been produced yacht Nautitech 441 called Star Light. This yacht is based in port Athens around Athens in Greece. You can take in up to 12 pax on the boat Star Light. Scheme of berths is 12 (8+2+2). There are 6 cabins placed below sailboat's deck. Star Light has 4 heads with showers. Use the search engine for search for other vessels under the link: Catamarans Athens. In this vessel is applied engine 40. With 13.47 meters of lenght and 6.81 meters of width Star Light provides enough space for comfortable sailing. Nautitech 441 Star Light is equipped with: Gps plotter, Autopilot, Bimini top, Anchor electric windlass, Dinghy, Radio / cd player, Outboard engine. . Nonrefundable caution is 3000.00 EUR. You can get different boats by clicking on this link: Catamarans Athens.